After graduating as a music and secondary education major, Heidi returned to her home state of Arizona and taught elementary music before earning a Master of Music degree in vocal performance from Arizona State University. She also directed church choirs and a community chorus, soloed with the Phoenix Symphony, and performed in such productions as Otello and Madame Butterfly for the Arizona Opera Company. She did an about-face in 2013, enlisting in the Army as a professional musician. 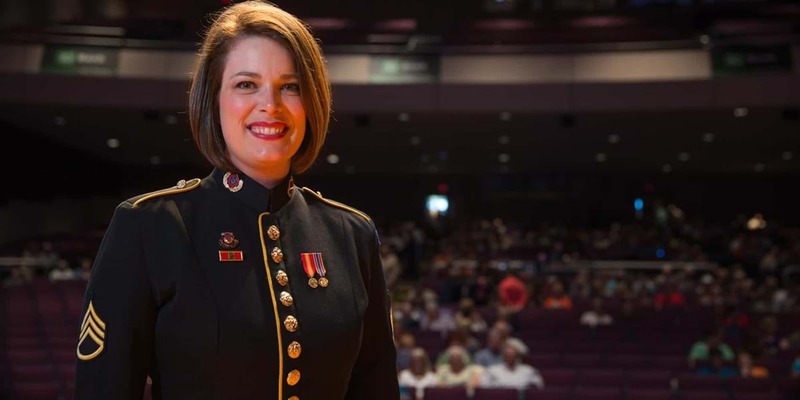 As a member of the U.S. Army Field Band and Soldiers’ Chorus, she is on the road 100 to 120 days a year carrying the Army story through music to audiences around the country. I felt well prepared for teaching and graduate school. I was passionate about what I was teaching, but beyond that, I believed it was my job to love students with my whole heart and be a constant presence of nurturing support and inspiration. As a performer, Northwestern readied me for the “real world” through my recitals. During my junior and senior years, I performed hourlong recitals consisting of repertoire from varying time periods, languages and styles—all fully memorized. These experiences taught me a foundation of discipline I built upon in grad school. What did you most appreciate about the music department? I appreciated that the department was small enough to enable professors to invest ample one-on-one time with students. I developed strong ties with the faculty that are still solid today. In what ways did your music studies at Northwestern challenge and strengthen your faith? College was a time to authenticate my relationship with God. I learned how to listen for his calling. I learned to trust myself and my Savior so I can confidently step out in faith on whatever path I'm called to follow. It’s been said that “he who sings prays twice.” I believe that whole-heartedly and take my job as a performer very seriously. I have so many! I toured the West Coast with the A cappella Choir and Mexico with the Symphonic Band, studied art and theatre in England one summer, and served with missionaries in Italy another summer. I loved my time at Northwestern and tried to take advantage of all the opportunities afforded to me. One of my favorite memories occurred post-graduation. In April 2013 I sang Handel’s Messiah as a principal soloist under the baton of Dr. Holm alongside the Sioux County Oratorio Chorus and Northwestern’s Heritage Singers. It is still one of my favorite moments as a professional singer. I hadn’t been back to campus since graduation; it felt like I was returning home. I was so proud to sing for my former professors and show them that the seeds they planted in me had been cultivated and bloomed into the singer I’ve become today! I get paid to sing! I’m honored to serve this country while at the same time following my calling to sing. I also love the breadth of repertoire we perform: opera, pop, jazz, musical theatre, spiritual and classical. In January I soloed in our Opera Scenes program singing Mozart, and on the spring tour, I soloed in an arrangement of Cyndi Lauper’s True Colors. I love the challenge of singing so many different styles. I love performing, but I love the classroom and conducting with equal passion. I plan to work toward my doctorate in choral conducting so that when I feel called back to the classroom, I will have the credentials to teach at the collegiate level.